Sign-up to stay informed about upcoming iBwave Webinars Click here to view upcoming webinars. Large scale enterprise Small Cell deployments. What's the Big Deal About Voice over Wi-Fi? Here is what will be covered.. Deploying a public safety network involves many different steps, from the initial planning and design of the network to the ongoing maintenance and support of the network. Interested in learning what it takes to effectively deploy a public safety network? Join us for this Safer Buildings Coalition webinar along with guests C2 Systems, and the Safer Buildings Coalition, to walk through the lifecycle of a Public Safety network deployment. Designing a Wi-Fi network in a stadium can be a challenging task - but in the end, it's all about the fan experience. Watch this webinar for a deep dive into Wi-Fi stadium design. What impact does seating have? Body Loss? Should the APs go under the seat? Overhead? To the side? Learn what factors to consider and when to use each design approach to provide fans with the best wireless experience. In this webinar, we bring together CBRS experts from different sides of the table to discuss the basics of CBRS, its potential impact on the Enteprise and wireless industry as a whole, as well as some of the expected network design challenges. In the webinar, we'll be joined by Federated Wireless and SpiderCloud Wireless and welcome Rowell Dionicio from the very popular Wi-Fi focused 'Clear to Send' podcast to moderate the conversation. What is happening with policy surrounding CBRS? How can it be accessed? What is happening out in the field - is it being implemented now? What will the impact be for those designing wireless networks? What do they need to know? What's the difference between designing CBRS and other technologies like Wi-Fi? What will be the biggest challenges for designing CBRS networks? To address network densification and to make the transition to 5G efficient, a common platform for building survey, RF planning, design & implementation and file storage should be used. In this webinar we will also share how iBwave’s product suite can help your company eliminate redundancies and reduce life cycle of a project. Join industry analyst and futurist Dean Bubley for an insightful look into network convergence and the need to “future-proof” current infrastructure. Dean will discuss the changes ahead for enterprise in-building wireless and the key drivers influencing them - technologies such as 5G, cloud-RAN and fiber-based LANs, private cellular networks, shifting regulations, the emergence of IoT and the evolving stakeholder landscape. Emergence of new service-provider models such as neutral-host, hybrid MNO/MVNOs, private & enterprise cellular, building-as-a-service companies etc. When it comes to designing Wi-Fi networks, different types of venues have different types of challenges. Some venues are straightforward, some venues are much more complex. Join us with Wi-Fi thought leader Tom Carpenter who will discuss the challenges of designing WLAN networks in complex environments. For each type of venue he will cover challenges like coverage, capacity, interference and 802.11 standards support. We've all been to a hotel with poor performing Wi-Fi and know the frustrations that come with it. And we're not alone - over 80% of people consider Internet Access the most important hotel amenity they look for. That is significant. Join us for this webinar on 'How to Design Better Wi-Fi in Hotels' with Wi-Fi experts David Coleman (CWNE #4) and Gregor Vucajnk (CWNE #96) of Aerohive Networks. In this webinar Gregor and Dave will use the 3D model of a high-rise hotel venue to show you what the biggest challenges are to designing Wi-Fi in hotels—and what the best practices are to overcome these challenges. Help the world achieve better hotel Wi-Fi. Join Wi-Fi experts Gregor Vucajnk and Dave Coleman of Aerohive Networks on the deck of a special 3D spaceship to learn the 'Do's and Don'ts' of deploying a Wi-Fi network so great it could beam Scotty up. Join us and go where no webinar has gone before. Ever wonder what the impact of selecting the wrong wall material can be? Or setting the floor plan scale just a little bit incorrectly? How about modeling a flat surface instead of an inclined surface? The answer is....all of these seemingly small modeling errors can have very large impacts on both network performance and cost. Join us as our resident Wi-Fi expert, Vladan Jevremovic, discusses just how critical modeling a venue during a wireless network design project can be and exactly what the impact can be when things are done even just a little bit incorrectly. And of course there will be lots of time to answer any questions you have. High‑performing Wi‑Fi networks are absolutely critical in today’s enterprise environment; without them, customers, employees, and business operations can all be negatively impacted. Problem is, these high‑performnig Wi‑Fi networks are not always simple to design in complex enterprise environments where the number of devices, people, and network data traffic is constantly shifting and growing. Join Greg Ferro from Packet Pushers as he moderates this interactive and informative webinar on Enterprise Wi‑Fi network deployments. Learn what you can do to design better Wi‑Fi in the enterprise environment and also what you should avoid doing. Join iBwave and Packet Pushers for this lively and interactive conversation. Webinar with Dean Bubley – a leading tech industry analyst and futurist, specializing in the analysis of the telecom, mobile and wireless industries. In this webinar Dean will discuss future trends impacting in‑building wireless design, and look at what applications and user‑expectations might be 5 to 15 years from now. Because while today’s uses of indoor wireless networks are well‑known and described, a huge evolution in devices and user behaviour is expected in the coming years (IoT, robotics and sensors, 5G, private cellular networks, etc.) that can potentially disrupt the reliability of today's networks. Join Dean and Ziad as they discuss this topic and answer the question ‘How can we best design today’s networks to support the networks of tomorrow’? In today's world, wireless technologies are all converging - Wi-Fi, Small Cells, DAS. To design high-performing Wi-Fi networks it's important to understand the impact of convergence, and how wireless technologies can work together. Join this webinar with guest speaker Ronald van Kleunen, CEO Globeron. He is sharing Wi-Fi design strategies and standards and the impact cabling has on planning of Wi-Fi networks. Cabling and Wi-Fi, how do both communities come together? Interested in learning how different prediction methods influence the accuracy of your network design? Join the webinar and learn the best practices of maximizing the precision of your wireless projects! Vladan Jevremovic , Research Director, iBwave Solutions Inc.
Do you find capacity planning challenging? Join iBwave's very own CWNA - certified Wi‑Fi expert Vladan Jevremovic for this webinar. The challenges of capacity planning and the importance of taking into consideration not only user profiles, but the building's hotspots (capacity zones). The influence of data throughput granularity on capacity. Capacity planning for small cells. How LTE‑U may impact Wi‑Fi capacity in the future. Vladan is also showing the newest capacity planning capabilities in the iBwave Wi‑Fi® software and the accuracy advantages it can provide. Designing a carrier‑grade wireless network takes into account much more than RF design.You have to consider all aspects of the project such as documentation, equipment, power, backhaul and cabling. Join us for this case study webinar where iBwave’s Benoit Fleury will take you through the key steps and challenges of designing a converged network for a busy 5-star hotel in Mumbai India. Imperatives of carrier-grade indoor networks. Steps and considerations for proper carrier grade design. KPIs for ensuring positive end user experience. Lessons learned from a converged indoor network design case study. Designing a carrier‑grade wireless network takes into account much more than RF design. Join us for this case study webinar where iBwave’s Benoit Fleury will take you through the key steps and challenges of designing a converged network for a busy 5 star hotel in Mumbai India. GImperatives of carrier-grade indoor networks. Want to hear how WZC Networking cut the design time by 50% for a convention center Wi‑Fi network? Hear from WZC Networking about how iBwave Wi‑Fi® and iBwave Wi‑Fi® Mobile helped them complete the re‑design of a Wi‑Fi network at a convention center 50% faster while meeting all of the KPI compliance goals. Showcasing the power of iBwave Wi‑Fi® - our indoor Wi‑Fi network planning and design software. In this webinar, we'll walk you through a project using iBwave Wi‑Fi® featuring it's all-new user interface. Guarantee a high quality Wi‑Fi network design. Minimize the time and costs to deploy a network. Ever wish there was a better way to plan capacity for Wi-Fi networks? Good news, with our latest iBwave Wi-Fi® release we're conﬁdent we’ve just developed the most powerful and accurate way to plan capacity for Wi-Fi networks. Plan capacity for Wi-Fi networks at a whole new level of accuracy. Deﬁne capacity by the number of users, location of users, types of devices and applications, and by venue hotspots. View the average throughput heatmap, so you can easily show what the user experience will be in 3D. Enterprise small cell deployments are gaining momentum as a response to today's connected workplace that relies on mobile devices for its every day operations. To tackle the exponential growth in data traffic, Enterprises are looking at small cell solutions to add capacity and serve the communication needs of all employees and visitors. Join Small Cell Forum’s Peter Love and iBwave’s Benoit Fleury as they talk about the challenges and best practices of Enterprise small cell deployments and illustrate a real life small cell case study at a major hotel in Mumbai, India. Why is Enterprise small cell gaining popularity? What resources are available for Enterprises to better understand and manage small cell networks? What are some of the challenges and road blocks in deploying small cell networks? How can iBwave help you simplify your deployment and save time? Want to learn more about the critical aspects of capacity planning and how it can lead to great Wi-Fi networks? Or want to get a firsthand look at iBwave’s revolutionary new capacity planning capabilities? Join us with industry expert Andrew von Nagy, as he talks about the critical aspects of Wi-Fi network design and capacity planning. We will finish off with a short demo of iBwave’s new Wi-Fi capacity planning capabilities and how they can help simplify your next project. Andrew von Nagy & Marc-Antoine Lamontagne , About Andrew von Nagy: Networking Professional, Revolution Wi-Fi / About Marc-Antoine Lamontagne: Senior Product Manager, iBwave Solutions Inc. Ever get complaints about the Wi‑Fi network ? It can be really hard to design reliable Wi‑Fi networks that perform no matter how many mobile devices, technologies, or people are on the network at the same time. At iBwave Solutions we provide IT teams with the simplest and most reliable tools to design and maintain excellent Wi‑Fi networks in the enterprise. Join us as we go over the iBwave Wi‑Fi® Suite of tools and how they can help you and your team provide Wi‑Fi networks nobody will ever complain about again. Join our Demo for a first look at iBwave's new capacity planning capabilities. “We need a more reliable way to plan capacity” - words we’ve heard many times over the years. So good news, a more reliable way is finally here with iBwave 8. With capacity planning, heatmaps, and compliance results all done in the design, you’ll never have to spend time planning capacity in a separate spreadsheet again. Identify and set capacity requirements for high traffic zones - because the janitor’s closet doesn’t need the same capacity planning as the conference room, right? With fully HetNet capacity planning, identify VoLTE, VoWiFi and split traffic by operator and technology (2G, 3G, 4G, Wi Fi) when planning capacity. Marc-Antoine Lamontagne , Senior Product Manager, iBwave Solutions Inc. Designing an in-building wireless network can be a daunting task if you don’t have the right tools. Luckily there are solutions that can simplify your life, starting from the site survey all the way to the final design and deployment phase. Join us for a webinar, featuring a real life case study and learn how the right tools simplified the UMTS to LTE upgrade of a Tier-1 Carrier office building in downtown Denver. See how we were able to collect and share site data efficiently, and even validate the data while on site to avoid recurring visits. An emergency can happen anywhere and anytime, in the event of a crisis reliable communication is essential for public safety personnel and first responders. While outdoor communications are well-managed, there are still quite a few challenges to ensure flawless in-building coverage for public safety communications. Join us for an informative webinar as we try to decode some of the most puzzling in-building public safety communications challenges and leave you with some key takeaways that can be applied globally. Si eres diseñador de redes small cell, entonces sabes muy bien que temas como la caída de llamadas y el throughput pueden causar serios dolores de cabeza después de la instalación. Únete a iBwave y no te pierdas este webinario exclusivo para aprender a brindar una experiencia inalámbrica excepcional. En él, presentaremos el estudio de caso “Estadio Gross Memorial de la Universidad Fort Hays” de Airvana (ahora CommScope). Gracias a que pudimos modelar la red con precisión durante la etapa de diseño y predecir tanto la potencia como la calidad de la señal, el equipo logró eliminar las suposiciones durante el proceso y entregar un diseño de red small cell que no presentó inconvenientes una vez implementado. Y además, satisfacer el gusto de los fanáticos por las aplicaciones móviles durante sus eventos favoritos. Voice over Wi-Fi (Vo Wi-Fi) is evolving as the next big thing in voice calling, and major carriers like AT&T, Sprint, Rogers and Bell are jumping on board to offer the service. Vo Wi-Fi lets you make phone calls using Wi-Fi instead of your carrier's network (no need to open Skype or WhatsApp). Join special guest speaker Ray duTremblay Vice President Building Technology Systems at WSP | Parsons Brinckerhoff, as he shares his unique take on Wi-Fi calling. Vo Wi-FI not only meets the customer’s demands for increased connectivity but also provides a welcome option for architects and designers who will realize cost and space savings when it comes to choosing Wi-Fi over DAS. With over 72 million mobile subscribers, Turkey is home to a strong telecom sector. Now with the upcoming launch of 4.5G – LTE services, the Turkish telecom market is all set to speed things up and cater to the urbanized Turkish consumers’ growing demand for high speed data connectivity. Join us for an informative webinar as we explore the challenges and considerations involved in deploying advanced 4.5G and LTE networks. We will share LTE network design best practices based on our global experience and present solutions geared towards the Turkish eco-system. Solutions and Recommendations for the Turkish market. So many projects, so much mismanagement. As a system integrator you know that improper planning and resource allocation can lead to disastrous results. Even with project management software, in-building design projects often end up taking longer (much longer) than planned and costing more than budgeted. Too often, projects are doomed to fail because they didn't get enough support from other departments due to lack of collaboration and communication. Join us as we discuss the most common challenges faced by project management teams and of course how to solve them! Join Scott Pereira as he walks through the example of a hotel's Wi-Fi network design using our newest product iBwave Wi-Fi®. 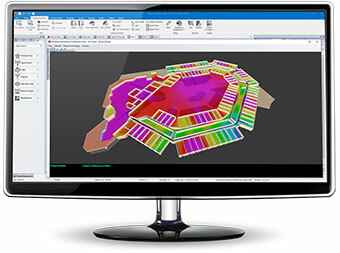 With cloud connectivity, active and passive survey capabilities, stunning 3D modeling, a full database of all network parts to design from, advanced prediction calibration, detailed reporting and a free viewer for your customers, iBwave Wi-Fi® is the most productive way to design and deliver your Wi-Fi projects. As you probably know, there are many terms used interchangeably within Wi-Fi that often lead to confusion for both the industry and customers alike. So let's review the Wi-Fi terms we use and when we use them. For example, isn't it time to stop calling it a survey when we really mean design? And when we talk about survey, are we in the pre-deployment or the post-deployment stage? What about that oxymoron "predictive survey"? Should we just drop the term survey all together? I'm confused even while writing these questions. Join Wi-Fi expert Alan Blake as he talks about what Wi-Fi surveying is, what Wi-Fi design is and how we can better clarify the terminology confusion through each critical phase of the Wi-Fi network design process. Many aspects of Wi-Fi operation and performance can be counter-intuitive, which can ultimately lead to poor design decisions and a poor experience for the users on the network. Join us for this webinar, led by industry expert Andrew von Nagy, to learn about the 7 most common myths surrounding 802.11ac Gigabit Wi-Fi that leads to poor-performing Wi-Fi networks, the realities of those myths and how to design high-performing Wi-Fi networks. Contemporary shopping malls offer more than just shopping opportunities. Many include individual restaurants and bars, a food court, movie theater, gym, skating rink, etc. Malls nowadays serve as anchors of social life in suburban areas and visitors consider wireless connectivity to be a critical aspect of their overall shopping mall experience. Given these trends it is essential to have an in-building wireless network that provides superior coverage with no compromise. Distributed Antenna Systems (DAS) and Small Cells are essential to delivering in-building wireless coverage, however without proper planning and testing they can be costly to deploy and may result in a sub-optimal user experience. Join us for part two of this exclusive webinar presented by iBwave and PCTEL. Best practices plus time and cost saving techniques for efficient project management during each step of an in-building project. If you design small cell networks then you are well aware that issues like dropped calls and throughput can cause some major headaches after deployment. Join iBwave and Airvana for this exclusive webinar and learn how they collaboratively delivered an exceptional wireless experience at Fort Hays University’s Gross Memorial Coliseum. By being able to accurately model the network to predict both signal strength and quality at the design phase, the team was able to take the guesswork out of the process and deliver a small cell network design that ensured no surprises after deployment. Plus it satisfied the fans’ appetite for mobile apps during their favorite events. While RF coverage at open air stadiums may be provided by surrounding macro networks, such densely populated venues require exceptional signal quality and enormous capacity to support 4G data usage. These requirements are best fulfilled by building a wireless network inside the stadium, with its own cluster of NodeBs / Base Station sectors. This exclusive two-part webinar series presented by experts from iBwave and PCTEL will take you through the steps in the lifecycle of an in-building network project and focus on some of the major challenges and issues encountered in indoor venues. Best practices plus time and cost saving techniques for efficient project management during each step of an in-building project.. Collecting RF data during a site survey is critical for providing optimal indoor network designs and understanding the existing RF environment is the first step in creating an excellent wireless network design. Integrating RF data into wireless designs has traditionally been a manual and error prone process that can take hours. Welcome to the new era of RF data collection, where your mobile device becomes your field-based design tool and where integrating this data into an in-building design is now done with a simple click of the mouse. In this webinar, you will learn from industry experts on how to simplify and automate your RF collection and integration process, saving you hours of tedious data processing and import steps. Demand for data is skyrocketing and more operators are offloading data traffic to less expensive, and more flexible, small cell and Wi-Fi networks. Especially in crowded venues. But the problem is there’s currently no way to design the high quality HetNets needed to handle the cellular offload. The cellular teams use one tool to design and the Wi-Fi teams use another. Which is exactly why we’ve completely reinvented the core of our industry standard design software to be just as good at Wi-Fi as it is for cellular. Emails, video conference calls, and heavy downloads are just some of the actions that business people do on their mobile phones daily. Strong, reliable and fast wireless connectivity is no longer a nice to have at the workplace – it is a MUST. Watch this webinar to learn from AT&T, Sprint, Crown Castle, and ExteNet Systems how they teamed up to tackle the massive data demands of the 2015 Big Game, and what they see as the future for networks. Deploying Wi-Fi in stadiums can quickly become complicated, time consuming, and expensive. But the fact is, there's a rapidly growing demand for Wi-Fi access in stadiums across Europe. Fans no longer just want their favorite teams to win; they want to share it with the world! Learn the challenges of deploying Wi-Fi in stadiums and how to overcome them. When it comes to indoor DAS, Small Cells or Wi-Fi networks, site surveys are instrumental in ensuring optimum designs, but typical processes can be overly complex, time-consuming and labor-intensive. As a result, integrators are increasingly looking for proven and effective strategies to simplify data collection, save time pre-and post-surveys, and ultimately improve their ROI (Return On Investment). In this exclusive presentation, you’ll hear from two leading system integrators and learn, through concrete examples, how they have managed to increase productivity while reducing their costs and accelerating their operational performance, from the initial site survey and all the way to deployment and operations. Practical examples of cost savings and operational efficiency. With the emergence of 4G (Fourth Generation) wireless technology, today’s consumers have come to expect fast and pervasive internet access while on the go, in the same way that they would experience it at home or at the office. Wireless carriers increasingly understand how the user’s experience is affected by their ability to access the network in public venues. During this webinar, we have discussed the typical indoor wireless systems, RF design challenges and best practices for public venues, while taking into account 4G network performance requirements. Campus environments have become one of the new verticals that wireless operators plan to invest in recent years. In this webinar featuring iBwave, CommScope and AT&T, the drivers behind the high capacity demands and the coverage options for campuses will be discussed. Capacity planning best practices and lessons learned in campus environment deployments will also be looked at. As indoor LTE becomes common place, and Wi-Fi remains the dominant enterprise wireless choice, considering each technology’s strengths and weaknesses is now a key aspect of evaluating the wireless network in healthcare environments. Join thought leaders from Black Box and iBwave to review the challenges, technical and business considerations one must face when choosing among the many wireless options available for hospitals and other healthcare facilities. Considerations for architecture, user profiles and building use will also be discussed with the use of real-world deployments done by Black Box.